Our tenured agents work hard to ensure our customers are well covered and taken care of properly when they need to file a claim. When it comes to crop insurance, our dedicated agents are the experts. Greg and Roger work tirelessly to get customers the rates and coverage they deserve. Each has over 25 years of experience with Wilson Insurance Agency. Feel free to contact them any time with questions, concerns or to request a quote. To learn more about our dedicated crop insurance agents, check out their Team Member profiles on the Our Agency page. 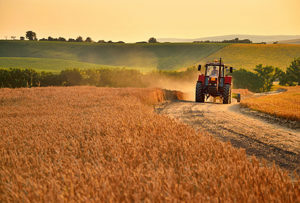 As an agricultural producer, it may be easy to overlook crop insurance as an unnecessary expense. Unfortunately for us in Central Illinois, tornadoes and hailstorms are a dime a dozen. When it comes to the business that brings home the bacon, there is little room for error. We recommend our customers invest in crop insurance as an alternative to the financial stress after disaster. At Wilson Insurance Agency, we know we can’t stop a flood. However, we can make sure our customers’ crops are covered if a flood tries to stop them. It is well known that crop insurance provides coverage for natural disasters such as hail, flooding and drought. Did you know you can also obtain protection from loss of revenue due to a decrease in the cost of agricultural goods? At Wilson Insurance Agency, we offer simple yield protection as well as revenue protection policies. Crop-revenue insurance guarantees a set amount of revenue, as opposed to production alone. If you are in the agricultural business, consider crop insurance as a means of loss prevention. Give us a call at (309) 364-2342 and ask to speak with Greg or Roger. If you prefer, stop in for a cup of coffee anytime! Our office is located at 329 Edward St. in downtown Henry, IL. Alternatively, you can fill out our contact form to request a quote online.